The flag ladies you’ll find in some churches fascinate me. They’re the equivalent of a church dance team, although there’s no pelvic gyrating. Their feet hardly ever leave the floor, which keeps them from doing anything that might look like actual dancing. I grew up Baptist, so dancing was always a big no-no, right up there with smoking, drinking, and dating a Methodist. 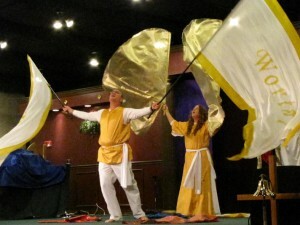 So instead of dancing and “grieving the Spirit”, flag teams simply flap their arms while holding brightly colored flags. Warning: do not try this near an airport. Trust me on this one. Also, they wear white or shiny silver dresses, often embroidered with gold trim and draped with a sparkly gold sash. You know, just like real angels wear! These “more modest cousins” of the leotard look like large white Snuggies and are designed specifically not to call attention to the female form. And since the dancer’s build is not a prerequisite for those participating, this is merciful. Surprisingly, there are a few “flag guys” too. These are usually husbands of the flag ladies who have done something so heinously wrong, they’re having to pay their way “out of the dog house”. You can spot them easily – they’re always that one awkward guy standing in the middle. Anyway, the rest of us men feel embarrassed for them in their fallen state. We try to avert our eyes and just look away from their shame. When other men like me see them, we feel embarrassed for their fallen state. We avert our eyes and just look away from their shame. The flags are attached to long poles. However, do not under any circumstance refer to what’s happening as a “pole dance”. Those flags can really leave a mark – again, trust me. The performers twirl the poles in time with the music. Since the movements are easy and the music often prerecorded, this avoids the need for anyone with actual talents or training to participate. We once had a flag lady “go rogue” on us in one church. She left the safe confines of the cleared platform area (which was barren except for a few unfortunate ferns standing prone to stray poles thrusts) and ventured down to the front floor area. Caught up in the throws of worship, she then careened out of control across the length of the front row, swinging her flag just over the heads of the cowering crowd. If this happens in your church, you have a big problem. That’s because flag poles are nothing more than large metal spears. They are capable of shish kabobbing unsuspecting church members like a holy Vlad the Impaler. God forbid anyone in that front row stands up to go to the restroom – they’ll have their “clock cleaned”. Glitter from the “King of Kings” embroidery will be permanently implanted into their foreheads. I admit, it’s better than having the “mark of the beast” there, for sure. But it’s still hard to explain the next morning at the office just why your forehead is sparkling. During a particularly vigorous routine, “Rogue One” (as we called her) got very close to the pastor’s wife and her Ph.D. (“Pentecostal HairDo”). I saw one of the pastor’s bodyguards flinch – I think he was deciding whether to throw himself in front of her, willingly taking a bullet for the queen mother. Next thing I knew, they wrestled her to the ground as if she were Squeaky Frohm attacking Gerald Ford. Actually, I think I might have just imagined that last part. I believe flag ladies are good illustrations of why God allows churches to have different styles of worship. I know people criticize the number of different denominations, but I don’t think it’s necessarily a bad thing. Why? Because I have the option not to attend a church where worship is quite so life-threatening. Why? Because they don’t have to sit on their gifts while attending my church, which doesn’t happen to do flag dancing. I also have the option of attending a church where worship is not quite so life-threatening. I know, I sound like a snob. And I’m glad those ladies get to worship the way they want. But that’s the problem with too much of our worship – it’s more about what an individual wants and not about what’s best for the congregation as a whole. Churches have a tendency of giving in to the loudest, squeakiest wheels. And when those wheels come with a flagpole attached, you’d better know how to duck! And when those wheels come with a flagpole attached, you’d better know how to duck! At the same time, I’m concerned about what some of us call “freedom of worship”, which often seems to be code words for “being the center of attention”. Unfortunately, I’ve found that freedom is often just an excuse for excess and exhibitionism. When we came to the word “shout”, we heard a sound piercing through the room akin to a banshee giving birth to a wildebeest. Miss Beulah decided to take the song lyrics literally and let a high pitched scream rip right at that moment! I know we’ll all be worshipping together in heaven. But I’m trusting a few things may have changed by then. On that day when we see Jesus, all the rough edges will be whittled away from us. The worship will be awesome there, and maybe I’ll have a little more patience as well. Oh, wait…there won’t be flag ladies in heaven too, will there? Oh man…I hope they’ll be handing out some protective head gear!